IMPORTANT - Restrictions on use Ensure that the correct landing field is used - take care during lambing time. If in doubt the Northern Sites Officer (07966153668). No dogs onto the site or fellsides. A brilliant site, big and generally smooth, giving spectacular flying over a large area of mountains and lakes. Best in light winds. PG take off should be above the heather line on the grass. No scratching of the slope below the heather line. Excellent top landing and bottom landing at L1. Landing in the emergency fields at the foot of the hill needs thought. 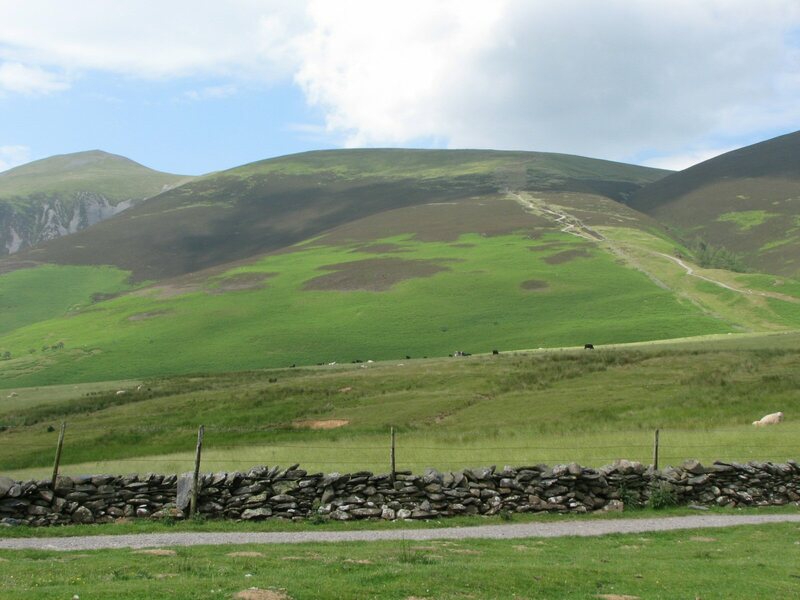 The take-off area of Skiddaw is at 2800' / 854m asl and gives a top to bottom height of 2460' / 750m if landing at the Latrigg landing area. THE FIELDS AT THE BOTTOM OF LATRIGG ARE NOT TO BE USED FOR LANDINGS! Underscar Manor (Underscar hotel on map). The postcode centre is on the access road to the car park about 1km to the west. Approach via a minor road which branches off from the large roundabout at the junction of the A66(T) and the A591 north of Keswick. After 800m a very sharp right turn winds up to the Latrigg "Monument" car park. Please park as tight as possible as this is a relatively small but very popular car parking area. Do not park on the fell side of the gate at the end of the car park - there is no permission from the current owners. You can drive through to drop gear off but do not leave your car here. Take the small gate at the south west end of the Monument car park area and head north following the track past the Monument and onto the slopes of Jenkin Hill. Mirehouse, Applethwaite, and Ormathwaite Hall. Contact Northern Sites Officer prior to flying for an update on T.O. or landing restrictions. Be aware of any wind gradient and keep well forward in strong conditions. This is a south facing massif with large areas of scree/rock which can create booming thermals in the right conditions - be ready! Beware of a light wind at take off then being difficult to penetrate at 3000' / 915m. Can be affected quite early by a sea breeze that then makes conditions very rough - especially in the gulleys. 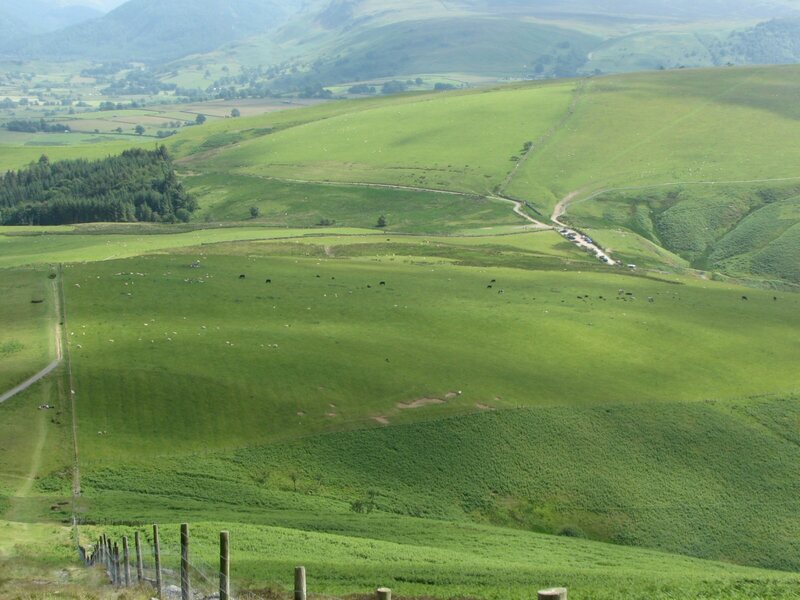 Bottom landing in any fields below or near to Latrigg is NOT permitted. There are many of military aircraft in this area during the week. The site should be notamed. The area out in the valley, to the west, towards Bassenthwaite Lake is an Osprey nesting area and care must be taken April-August. PG pilots must make the longer carry up to near the summit slopes of Jenkin Hill. Hangliders can take off just by the gate approx. half way up to Jenkin. OK to slope land on Jenkin Hill - beware of other wings taking off on busy days. Landing Field is the field to the LEFT of the path to Jenkin as you leave the car park. The field slopes downwards increasingly at its western end. 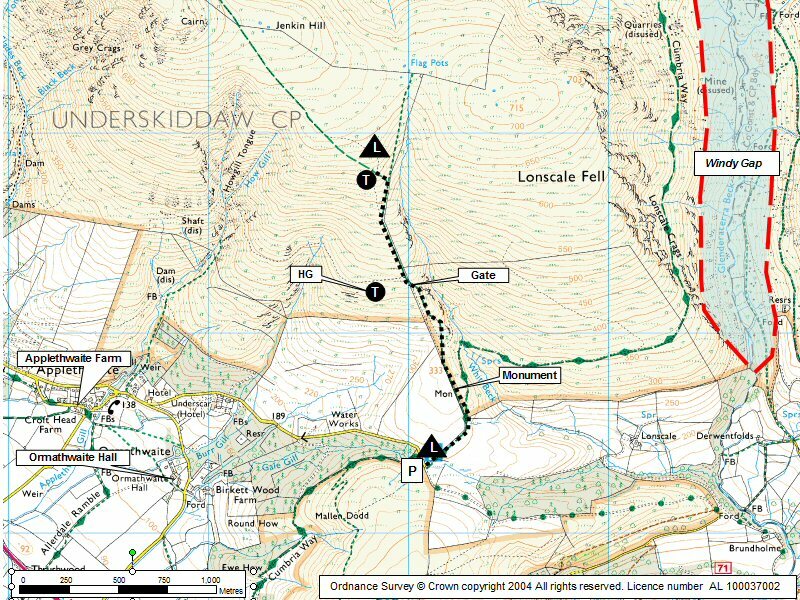 Be wary of the wind direction not being the same as on the hill you have just flown - Although the site takes a southerly wind, the wind in the landing field may well flow from East or west through the small "valley" between Latrigg and Skiddaw. A windsock is useful here. Hangliders - Can be quite a carry but well worth it. The HG take-off is just beyond the fell gate (1850' / 564m asl). An easy site to fly. Avoid ground skimming due to ground nesting birds. Excellent potential both downwind and, in the right conditions, for achieving large triangle flights. Keep well forward of windy gap if flying east towards Blencathra. An aerial view of Jenkin Fell with Skiddaw behind looking NW. 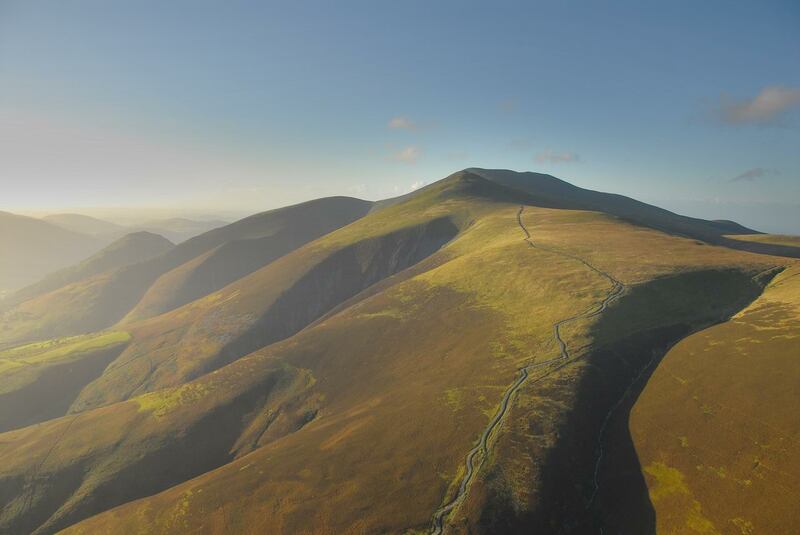 The take off area is in the centre right of the photo, above the bracken line and bounded by the main track up Skiddaw. Photo reproduced with the permission of the copyright owner, Andrew McMahon. More pictures can be found on his web site. Jenkin Hill from the path up Skiddaw. The path up is steep and can be clearly seen. PG take off is generally anywhere above the heather band to the left of the track. Looking down to the landing area from the gate on the fellside. The bracken area closer to the car park slopes and should be avoided. Google Street View - Parking An unusual picture of the car park at the foot of Jenkin Hill - it's normally much more busy than this. Pan to the left for a good view of the hill.